In the Multiplication Test Check, some of the multiplication tables will be used more frequently than others. 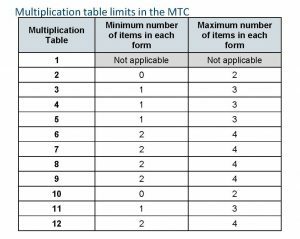 The DfE defines how much each multiplication table can be used in the grid shown above. Whether in practice this will make much difference in how you prepare for the test I can’t say. Want to read the full DfE document? Download it here.